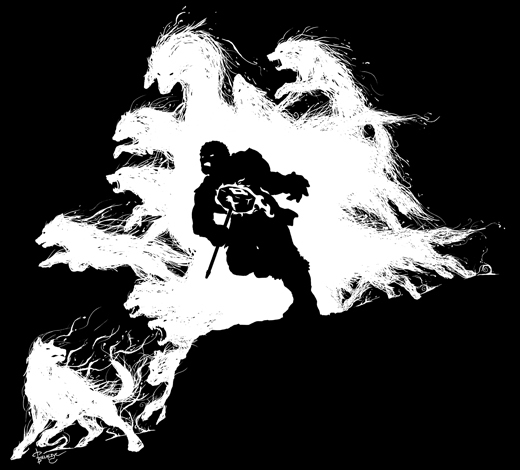 Officially licensed by the Wheel of TimeTM, The Wolf King is the second shirt design that I created for Ta’veren Tees, the wonderful folks who bring us all our Wheel of TimeTM apparel (and some other goodies too!). Continuing in the same style as the previous design, this art features Perrin Aybara rushing into battle carrying Mah’alleinir, the power wrought hammer. Coming to his call, the wolves flock to Perrin’s side to fight alongside him in the Last Battle. This piece is one of three, including The Prince of Ravens and The Dragon Reborn.